You know that phenomenon when you know that you should do something, but then you put it off because it seemed like such a daunting task, and you had other things to do, and figured it could wait a bit? And then after a while, it gets harder and harder to actually do it because you should have done it a long time ago, and how embarrassing that it's taken you THIS long to do it, and there are other things that you could do now that wouldn't be tardy, so you do those instead, thus perpetuating that cycle ad infinitum? Yeah, that's how I have been about try-on photos and reviews, lately. I have more than a dozen stored up on my phone, and they have all suffered from the above fate. But no longer! I have them all nicely cropped and edited, and they will be posted. Maybe one at a time, so that I can convince myself that it's actually not that daunting. Maybe. In any case, it starts here and now, with the Ace & Jig Ojai Crop in Ivy. Many moons ago, I ventured to a local boutique, having correctly predicted that 4th drop Ace & Jig had arrived, including some Ivy, my favorite textile of this drop, and I daresay one of my faves of the whole season! The Ojai Crop in Ivy (size XS shown) was a piece of particular interest, as it's reversible (2 in 1!) and cropped, which makes it shortie-friendly. It's a very easy shape to wear, and equally good over dresses, swimsuits, and myriad bottoms. 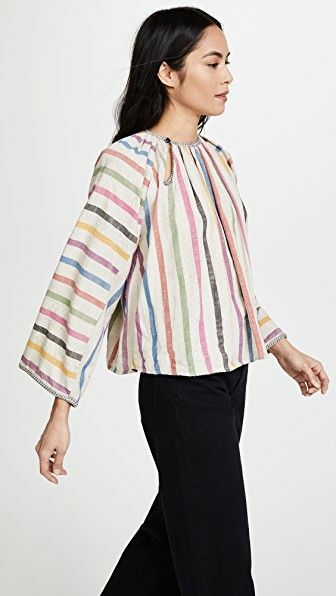 Style Description: Short-sleeved, boxy cropped top, with a split-v neckline, a subtle high-low split hem, and wide, split dolman sleeves. Very similar to the top half of the Suit-Up style this season. Size/Fit: Large to size. The XS was quite boxy, and the sleeves stuck out a lot in person, though it's less apparent from the photos. I would have sized down to a nonexistent XXS if possible. Neckline: Not too low-cut for petite ladies. Overall Thoughts: The Ojai Crop in Ivy is a solid pick for this season, especially in this reversible textile. Though I wish the sleeves stuck out a bit less on myself, taller ladies or those who are into a flutter sleeve probably won't mind. It's a great, versatile piece to have around during summer. I happened to be wearing my new Ivy Ra Ra Midi (an Ace & Jig Webstore XO), which allowed me to construct an impromptu Ivy suit! With 2 reversible items, it can be done 4 ways, though I personally prefer having a contrast between the top and bottom. Have you tried the Ojai Crop in any textiles? What do you think? Let me know in the comments or by pointing me to your post about it, and I'll be sure to link you! Ivy suit for the win!!!! Not sure how I feel about those sleeves, but this look like a good one! It was so hard not to walk away with this one! But I had already bought enough Ivy pieces and didn't quite love the sleeves.